Right … well I’m not sure where to even begin with this one. I’ve either been doing this for to long and I’m hallucinating again or I’ve just spent an exceptionally large amount of time around lethal cows, bandits and immensely silly humor. Wait … no it’s just West of Loathing and boy am I going to have fun telling you about this game. The first thing I really need you to note here it that this is an RPG. With this in mind, this review is based on more of a this-is-the-story-so-far-type thing. I’m still playing West of Loathing and I’m still thoroughly enjoying it but with tons of side quests and basically all the trappings you’d expect from an epic game I can only base this on what I’ve seen and done so far. If I try and give you a blow by blow you’ll still be reading this review when the sequel comes out. 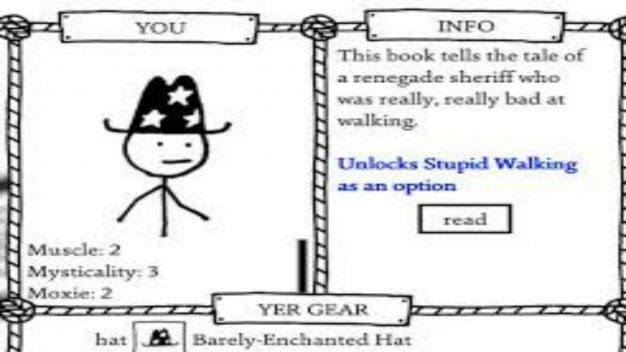 So in West of Loathing you begin with one of three character classes. You have the Cow Puncher which is basically your warrior type. As a piece of advice don’t go looking for fights with cows, (I can’t believe I’ve just said that,) too soon or you’re going to be getting your spurs handed to you in a neat little package with your teeth. Cows are demonic, evil, and absolutely hideous so generally not for beginners. You then have the Snake Oiler who i’d put closest to a rogue class … sort of. Lastly but not least you have the Bean Slinger, the mage class and the one I went for. Is any of this sounding silly yet? I really hope it is. Everything in this game is so wonderfully silly that you’ll keep playing it just to see what might be coming next. You’ll meet dozens of hillarious characters on your quest. As I’ve mentioned this is an RPG which is set in the West. Not quite the Wild West, more of a cowboy themed play on this scenario. There is also a slight feel of one of those choose your own adventure books we used to have as kids. Everything you do in West of Loathing is choice driven and involves basing decisions on different options you’re presented with. This is a stick figure adventure and there’s no spoken dialogue so there’s a huge amount of reading to be done. This isn’t a negative. Everything is so comically written that you won’t be skipping through reams of text just to get to the action. A lot of the game is played out between you and the narrator, who’s hilarious, and the choices you make based on the scenarios you’re put in. A brilliant example of this is a talking child’s doll that I found. Now this thing didn’t have a pull string and was looking at me funny so it was quite obviously cursed. Did this stop me completing a dark ritual that it asked for? No it didn’t. I’d like to tell you how that one played out but the doll vanished with some ominous laughter and I haven’t seen it since. Suffice it to say the narrator wasn’t massively impressed, not that I cared of course, after all this is my story. There’s tons of dialogue but it never gets tedious. So you’ll start in the town of Boringville and do a few quests for the locals to get you started. None of these are massively difficult and quests range from shoveling up horse dung to stealing back the Sherf’s cell door which has been acquired by one of the local gangs. Sherf isn’t a misspelling, play the game and find out. You’ll also meet your companion here who will travel with you for the rest of the game. I’m wandering around with a doctor who stopped doctoring when her dead stopped staying that way and started getting up and wandering around. You can also pick between a crazy prospector and the local bitter, twisted drunk. Your pardner will give your wandering a bit of focus and supply you with some story line, the rest you have to pretty much write yourself dependent on how you play. 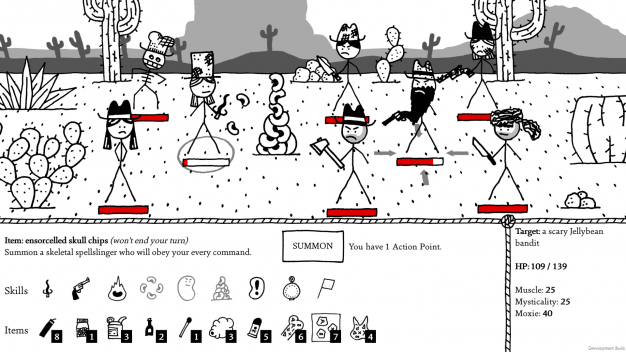 Skills and xp are an interesting concept in West of Loathing. You have your basic attributes which are improved with xp points which, if you want, the game will spend for you. I chose this option and I’m coming out with a very balanced character so actually this is quite a nice little way to play. It means that you’re not overly focused on your character development and can concentrate more on the story. I think we’ve all probably spent rather too much time micro-managing characters when we didn’t need to. The same rule also applies to your skills. You don’t choose your skills so you aren’t going to be fussing over them too much. You earn skills based on your actions and boost their levels by performing them. All the skills have nice western names. I have the dickerin’ skill for instance which gives me money off the prices when I’m bartering in stores. I’ve also got the Hell Bender skill which boosts my spell damage. Something else you pick up depending on what you do are perks. These give you a range of passive abilities. One of mine is Mostly Scabs, which boosts my armor. How did I get his? By walking into every cactus and other prickly item I could find of course! Another of my perks is Stupid Walking. This does as it says and behaves a bit differently to the first I mentioned. Certain perks are purely cosmetic and appear in the options menu so you can turn them on or off at will. I have one that turns my screen sepia, for instance, this was a bit off putting so I just turned it off and went back to walking around on my elbows. Graphically this game is brilliant. The entire look is very simplified, to the point where it looks like a five year old could have come up with most of the art. You and the entire cast are little more than stick figures. This fits the whole theme brilliantly. Nothing in this game is taken seriously and this is what gives it so much charm. Pretty much every RPG you play now has to have next-gen graphics and a sound track that is the collaborative effort of about three orchestras. As good as all of this is the one thing that is absolutely the most important thing in gaming seems to come second. Gaming is about having fun pure and simple and no amount of stunning artwork or breathtaking musical scores can acheive that. Of course if that’s what you want that’s fine but you won’t find it in this game, it’s very much fun first which is marvelous. I’m not finding a huge number of negatives with this game and I’m thoroughly enjoying myself. 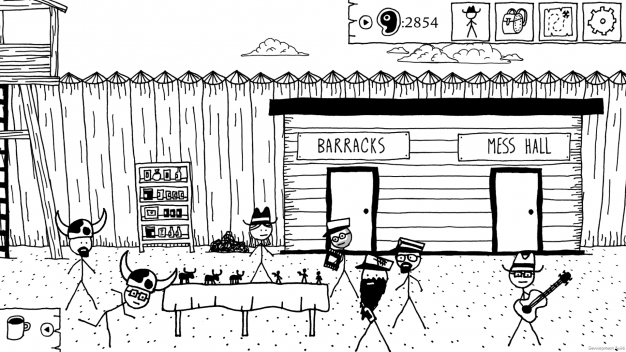 One this I will say is that West of Loathing is a game that won’t be for everyone. I have a pretty silly, twisted sense of humor so I’m really enjoying the witty story line as it unravels. I don’t mind the large amounts of text and rather like the graphical style. If you like your games serious or you want an experience that’s graphically stunning then you probably won’t enjoy this title as much. This being said, it’s going to be fairly subjective depending how you view what your gaming experience should be. Personally I’m happy as long as I’m hooked and I’m enjoying the game, the fact that I’m laughing a lot is just a massive bonus. As I mentioned earlier, there is also a lot of text to be read and again this doesn’t bother me, if it’s something that is going to put you off then again you’re probably best steering clear. 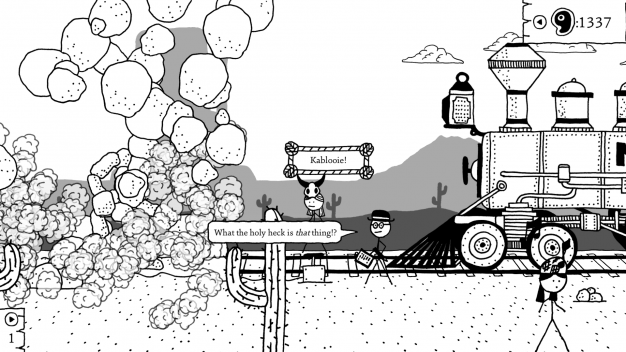 All in all, for me at least, West of Loathing is a really refreshing change from other games in it’s genre. I could go into way more detail about the items you’ll find and the combat system but these are things you’ll pick up as you play. I think that this title is well worth a few hours of anybodies time. At the very least you’ll get a chuckle out of it but if you’re anything like me I’ve a feeling that you’ll be as hooked as I am and very pleased that you’re time hasn’t been wasted. This is definitely one that’s staying in my Steam library and may well find a comfortable home in yours.